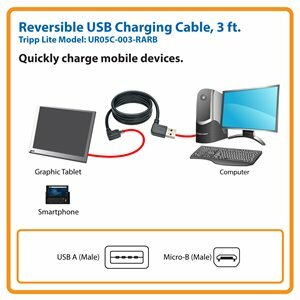 Tripp Lite's UR05C-003-RARB is a 0.91 m (3-ft.) Micro USB cable dedicated to charging mobile devices such as tablets and phones. Constructed of 20AWG power lines, it ensures the fastest charging of your device. It also features a Left / Right Angle Reversible A connector, which takes the guesswork out of which way to position the A connector for plugging. Its Left / Right Angle A connector and corresponding Right Angle Micro-B connector are ideal in situations where space is at a premium, and reduces stress and excessive bending on the cable. Unlike traditional USB cables that can be attached only one way, the UR05C-003-RARB has a reversible Type-A (male) connector that plugs into a USB port in either direction. This takes the guesswork out of USB connections and makes installation easier and faster. The UR05C-003-RARB is constructed of top-quality materials. For optimal connectivity, this reversible cable has nickel-plated connectors with gold-plated copper contacts. The cable’s molded connectors with strain relief guarantee durability and long life. A flexible PVC jacket makes the UR05C-003-RARB easy to install in tight spaces. For peace of mind, the UR05C-003-RARB comes with a lifetime warranty. It’s manufactured in compliance with strict RoHS specifications, reflecting Tripp Lite’s commitment to environmental responsibility.